Rose was scheduled to make his racing return last Friday at Nashville Superspeedway but failed to make the truck race lineup. He plans to try again May 2 at Kansas. Rose and I just missed each other at the track. I was running late, and when I went for him in the garage he’d just departed. He told Terrell Davis, host of a local racing radio show, that he hoped to see me somewhere down the trail. I covered Rose during his racing days at old Fairgrounds Speedway and was fond of him. He was bright and personable and showed flashes of serious talent. I thought he had the potential to follow a long procession of Fairgrounds racers up the NASCAR ladder, drivers like Darrell Waltrip, Sterling Marlin and Bobby Hamilton. Then came the news: Brian Rose had been arrested in a drug-related incident. I was stunned, but then I’m always stunned some a kid does something as stupid as messing with drugs and ruining his life. NASCAR, as is its policy, suspended Rose indefinitely. Not long after that I had a chance to talk to him and ask him what happened. He said his world had caved in on him – problems at home, aggravations, irritations, all the thorny problems that come with life. Most folks deal with them; some escape to drugs. Rose began experimenting with drugs and before he knew it – and would admit it – he had a problem. He said getting busted was the best thing that could have happened to him. It woke him up. When we talked that day, several years ago, I asked what his future plans were, and if he had any desire to return to racing. He said he didn’t know, that he was taking it day-by-day. His first goal was to stay clean. He’d deal with everything else later. He sounded sincere. I wished him all the best, and told him to keep in touch. 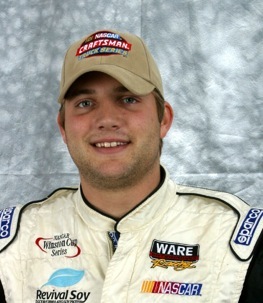 At times over the ensuing years when I’d hear about some driver getting busted for drugs, I’d wonder what ever became of Brian Rose, and how he was doing. I hoped he was OK. According to Davis, he is. Terrell said Rose is in good spirits and seems to be the same bright, outgoing youngster we used to know. He said he has his life in order. He appreciates the second chance NASCAR has given him and is determined to take advantage of it. That’s great news in more ways than one. It’s great to hear that a good kid learned a lesson from a bad experience and his life has been salvaged. It’s also an inspiring story for anyone else out there – driver or otherwise – who’s batting some sort of addiction: if there’s enough will-power there’s always hope. Maybe Brian Rose will go on to become a great racer and collect lots of wins. But if not, that’s OK. No matter how he does on the racetrack he’s already won the biggest victory of his life. I wish him well too Larry. Always liked Brian alot. I think he and my daughter attended Western KY Univ together. I met him a few times in the past too and always liked his open personality. I’m really thankful he’s kicked the drugs to the curb. Everyone deserves a second chance! :) I look forward to seeing him back on a track soon.